Heat oven to 350°F (325°F for dark or nonstick pans). Grease or spray bottoms and sides of three 8-inch round cake pans. In large bowl, beat cake mix, water, oil and eggs with electric mixer on medium speed 2 minutes, scraping bowl occasionally. Pour 1 1/3 cups batter in each pan. Bake cakes 17 to 21 minutes, or until toothpick inserted in center comes out clean. Cool 10 minutes; remove from pans to cooling racks. Cool completely, about 30 minutes. Divide frosting into 3 small bowls (1 cup each). Stir 1/2 teaspoon different color of food color into each bowl. Fit 3 separate decorating bags with 1/2-inch round piping tip; fill each with different color frosting. Place first cake layer on plate. Using green frosting, pipe around top edge of cake layer, forming a thick frosting border. Spread additional frosting over top of cake inside frosting border. Top with second cake layer; repeat border and filling with purple frosting. Place third cake layer on top; repeat with orange frosting. Pipe remaining frosting into mounds over top of cake, alternating colors and sizes of mounds. 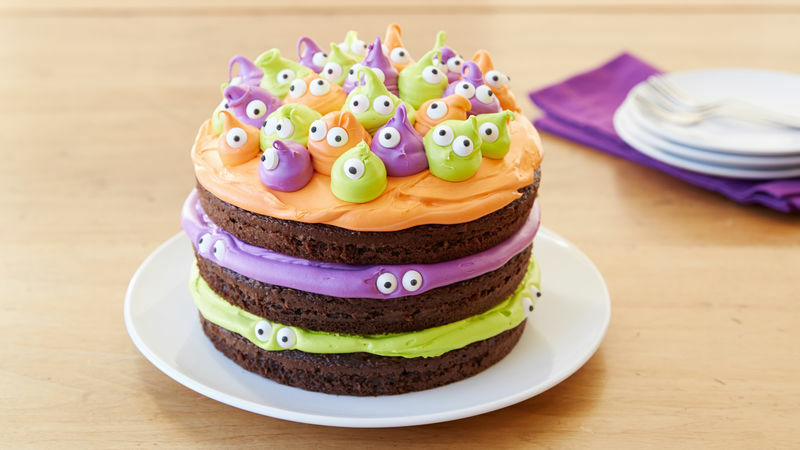 Decorate as desired using candy eyeballs on frosting mounds and side of cake. Store cake covered at room temperature. No decorating bags? Fill large resealable freezer bags; cut off one bottom corner, and squeeze frosting out to decorate.